As I begin to put pen to paper I am seated across from a swami at a cafe table in Thiruvannamalai, India. It’s very warm but the kiss of palm fronds against one another let me know a breeze is coming. The afternoon is relaxing and glorious. This morning we were up at 4:30 to head to the Ramana ashram for meditation. I was fidgety and a little uncomfortable so I lasted only about 20 minutes. I could have wandered around the ashram a bit longer but my overall energy was low so I chose just to head back to the hotel. Walking back proved to be my meditation. It was still dark but there was no fear, just peaceful awareness. As I gathered my shoes and left the ashram grounds I made my way to the sporadically lit dirt road that led the way back. Along the way I passed holy men on their way to the ashram, beggars setting up their posts, an occasional sleeping dog and a handful of cows. As I stopped to say hello to a black cow picking through trash I caught some movement out of the corner of my eye. A large rat was running from the trash to a better hiding place. I am convinced they are as disturbed by our presence as we are by theirs. Before I made it all the way back I was treated to the Muslim prayers being broadcast throughout the city. I fell in love with this tradition last time I was here. No matter where I am, if I can, I stop what I’m doing and close my eyes for the duration – about 2 minutes. I did this here, by the cow in the dark. It says a lot about the heart of a place when a female minority can stand with her eyes closed in the dark and KNOW she is safe. It’s what I came back for. Our day ahead is full as usual. There is a cave, a traditional ashram lunch, a different ashram tour and one of the largest temples in all of India. After gathering at the little hotel cafe for breakfast which is late as expected – time is very fluid here – we are back on our little party bus. We’re dropped off in the middle of town to visit the cave. There is a bent and peeling sign that points the way. We’re told this will be a relatively steep climb up a mountain, but so far it’s a manageable dirt hill. Along the way we pass groups of homes, some made of solid materials like brick or stone, others of thatch and mud or perhaps just a straw roof with fabric walls. The floors are all dirt or dung. As we proceed up, the incline becomes steeper and our path narrows. We’re walking up uneven, irregular stone steps. We continue to see private dwellings and personal shrines. We pass a house under construction. There are 3-4 young men setting stones in mud as a foundation. The stones are large and vary in shape and size. Because there is no official road leading up to this construction site these stones would have had to have been carried up on the heads or shoulders of individuals. As we watch the men work, a woman with at least a 5 gallon tank of water on her head approaches to help. The women are very strong here. The cave has become a house built around the cave. It is significant because a teenage boy tlraveled up the mountain in 1899 and lived in this cave for 17 years to become closer to God. And while the altar erected to this great swami was beautiful and touching it was the journey up that was magical for me. Next stop: Off to our traditional ashram lunch at Ramana Ashram. We are directed through an open door that leads us through some sort of kitchen area with giant silver soup pots hanging above counters made of wood and steel. The floor is stone. It looks like we shouldn’t be here but we are assured we are in the right place when a man in a skirt (dhoti) moves us forward. As we enter the hall we are greeted with rows of people seated on the floor. They are organized facing each other with room between for men in dhotis and bare feet with giant pots of food to walk. There are at least 30 rows of maybe 25 people each. Every person has a banana leaf and a cup of water in front if them. The water serves two purposes. A few drops are sprinkled onto the leaf to wipe it clean, the remainder is to drink. The men with the buckets approach. The rice is first and generous followed by dal, vegetables and a few other things I can’t identify. I am sitting across from an Indian man who might weigh 110 pounds. While I have a hard time finishing my first helping he is on his third. They eat quickly and a lot, saying next to nothing to each other. Meanwhile the rest of us are making all kinds of faux pas. Using our left hand by accident, folding our banana leaf the wrong way, and happily chatting. After correcting the way we had folded our leaves we left the ashram for a little shopping. Our afternoon was free and there were great little stalls across from the ashram. We buy some malas from a gentle soul who places the gift of a mala over our heads after blessing it as thanks. Ahead we spot Hindu deity and Buddha statues. We need some. The stall owner is chiseling and carving away in the dirt. He stops “making” to come help us. I’m firing away with questions when he does the little head bob and says, “Little English please.” So one word at I time I get our questions answered. His patience at our frenetic American ways is rewarded with 3 sales. Happy with our street purchases we head back to the hotel to rest. We have two more places yet to go today. Non-stop. Rested, sort of, we are back on the disco bus. We make one brief stop at a wacky swami’s ashram. Ramsuratkumar called himself the beggar and rarely cut his nails or hair and smoked like a chimney. They come in all shapes and sizes. This one was known for his quotes and kindness. His ashram is a museum to his sayings. Off we are again. This time to a humongous 25 acre temple. Ready? 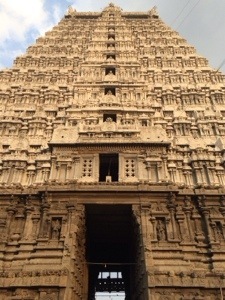 Arunachaleeswaran Temple. It was like going to an attraction. There were carts with stuffed Buddhas and deities, incense, candles and lots and lots of garlands for offerings in the road leading up to the temple. We must once again abandon our shoes. At this particular temple we must also go through a security gate. Once in it’s like we’re at Disney. We scatter in the slowest possible sense of the word; wandering toward whatever shiny thing catches our individual attention. Swami Divyananda corrals us back together and short of making us hold into the same rope she insists we stay together. In this temple there are countless shrines, gardens and courtyards. There is a cafe of sorts and an elephant. Yes, an elephant. A real one. Her name is Ruko (or something close to that) and she gives blessings. If you place a coin in her snout, she drops it in a bucket, then you bow in front of her and she taps you on the head with her trunk. It’s very sweet. We are also honored to receive darshan from Hindu priests who normally don’t allow non-Hindus in their inner sanctum. We bypass a long line of people, pass through one hall and into the windowless, sweltering hot room. It feels like we’re in a basement deep inside the earth. As sweat drips from every pore the priests asks everyone’s name – this is a big deal – then one by one we walk up to receive our personal blessing which is ash. We are to swipe it across our forehead. Rapid ceremony complete we are ushered out a different way ending up in a place that feels like a subway should be coming through any minute. Exhausted, sweaty and ashy we wander back out in search of our shoes. Barely able to pull myself into the bus I am counting on both hands how many times I have been blessed today.